There is a constant battle between Android and Apple smartphones, but there is no fight here with which brands supports mobile pokies the best – they both do. Our favourite software developers have optimised pokies to suit mobile devices, and since a large majority of people around the world own either an Apple or Android smartphone or tablet, we thought we’d take a look at how we play the pokies on these devices. We include everything you need to know so you can get tapping those reels. All of our favourite casinos have gone mobile and support most Android and Apple devices, including iPad, iPhone, Samsung Galaxy, Windows Phone, Nokia and many more. What’s more is they offer an extensive mobile pokies catalogue so you have a wide variety of mobile slots to choose from. Visit one of the many reputable mobile casinos we have listed above via your smartphone’s browser (Firefox, Chrome, or Safari) – we have included each welcome package offered so you can decide where to play – and sign up. You can do this on your Apple or Android device, and even opt in for the welcome page here, too. Whenever you play a casino game through your preferred Web browser, it’s known as “browser-based play” or “Instant Play” – a no-download gambling experience. Once you have an account, and you’ve funded it via the available mobile friendly payments, you can pick from an array of titles to play. We include a sample from their catalogues below. 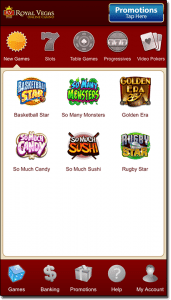 If you are a regular desktop player then there will be a few features to mobile pokies that you won’t be use to. There may be a few other features altered to fit the HTML5 platform, but you will get use to these quickly. While you can simply just access the sites above via your phone’s browser, there are other ways to make gameplay more convenient. While real money apps aren’t common in application stores, Royal Vegas created one called Regal Vegas that runs independently of your browser. Tap on the Royal Vegas app button to download directly on your Apple or Android smartphone or tablet. Other sites will offer web apps – these run via your mobile browser but remove any toolbars and appear on your home screen as an icon. If the site you have picked from above doesn’t offer one you can make one via your browser’s settings by clicking on ‘Add to Home Screen’. We have picked a few pokies from the catalogues of the above mobile casinos to offer a sample view into what they have to offer. 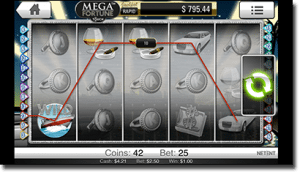 Mega Fortune – Progressives can be played on Apple and Android smartphones too, including NetEnt’s Mega Fortune that even broke a Guinness World Record for the biggest online win. There are three jackpots on offer here – the Rapid, Major and Mega, with the latter scoring you millions if you win. You don’t need to play the maximum bet here either, you just need to spin at least three Bonus symbols and hopefully score the jackpot when you spin the Wheel. Weekend in Vegas: If you have the latest Apple or Android device then it will be able to keep up with the incredible 3D graphics by BetSoft, specifically with slots from their ToGo line, including the 243 ways to win Weekend in Vegas slot. There are up to 20 free spins and multiple ways to play, including a high risk game, a balanced game, or a cautious game depending on which character you follow out of Loony Larry, Balanced Ben, or Cautious Chris, respectively. Older Apple or Android phones may not work as well, but try it out to see how it fairs on your device. Bridesmaids: Microgaming teamed up with Universal Pictures in 2015 and released the Bridesmaids slot, based on the hilarious film. 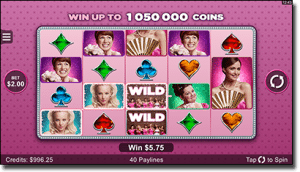 It features 40 paylines across 5 reels and 4 rows, as well as a multi-level bonus round that makes the slot perfect for mobile gameplay. The graphics are crisp and work well with Apple and Android devices. Playing the pokies on your Android or Apple device can be both beneficial and disadvantageous.